What would you say if a Cat in the Hat, came to a school where your little child sat? With kids gathered 'round to pay careful heed, the feline brought fun in learning to read. (March 3, 2004) -- With apologies to Dr. Seuss for our preceding adaptation, genuine Cat in the Hat rhymes and other prose echoed through LB area schools on March 2, part of "Read Across America" sponsored by the National Education Association (NEA) with help from local businesses. "Read Across America" is a nationwide event timed to coincide annually with the March 2 birthday of Theodor Seuss Geisel, better known as "Dr. Seuss." He'd be 100 years old this year...and we hope he would have enjoyed what we saw (pix below) at ELB's Newcomb Academy, one of many LBUSD schools taking part. Across the city, adults fanned out (many wearing distinctive Cat in the Hat hats) to read to LB schoolchildren. "Delighting kids with these stories reminds us all of the joy of reading," said LBUSD Superintendent Chris Steinhauser, who read to children at downtown's Edison Elementary School. LBUSD alumna Patricia Yvonne Leroux, who attended Grant Elementary School starting as a kindergartner, used the occasion to give $10,000 to the school to purchase library furniture. NLB's Addams Elementary School reported 35 guest readers on hand reading to 1,000 students in attendance...with former Superintendent Carl Cohn arriving at 7:30 a.m. to read Clever Beatrice to fifth graders. Board President Bobbie Smith, retired head librarian at Long Beach City College, stressed the importance of reading to young children. "There's no better way to encourage students to love reading than to share books that you enjoy," she said. Former Board of Education President Karin Polacheck read Where the Wild Things Are to kindergartners and discovered that half of them already knew the story. "They weren't bored," she said. "The ones who already knew the story had fun helping me read." Assistant Superintendent Karen DeVries said reading is the top priority in all 60 LBUSD elementary schools. She also read at Addams and was invited to Read Across America events at Lafayette, Burcham, Burroughs, Gant, Gompers, Henry and other elementary schools. 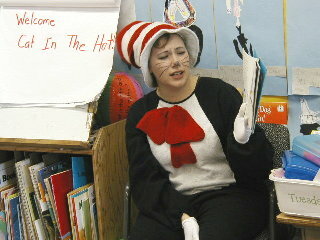 LBReport.com had a Cat in the Hat sighting at ELB's Newcomb Academy for Academic Excellence. 37 boys and girls from two pre-K classes joined together for their reading of the Dr. Seuss classic. Teacher Marilyn Crane (right) kept watch on her students, who enjoyed the rhyming text while wearing snazzy cardboard Cat Hats. Mrs. Crane told LBReport.com, "Reading aloud to young children is important because it increases their communication skills. It's interactive -- unlike television -- and it develops their love for books." Teacher Karen Fontes (left) also kept an eye on her pupils and an ear on the proceedings. 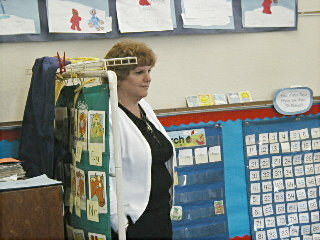 Mrs. Fontes told LBReport.com, "Reading aloud to young children teaches basic reading skills such as phonics, rhyme, etc. and develops their love for reading." Cat in the Hat volunteer readers were graciously provided by the Target store at 2270 N. Bellflower Blvd. 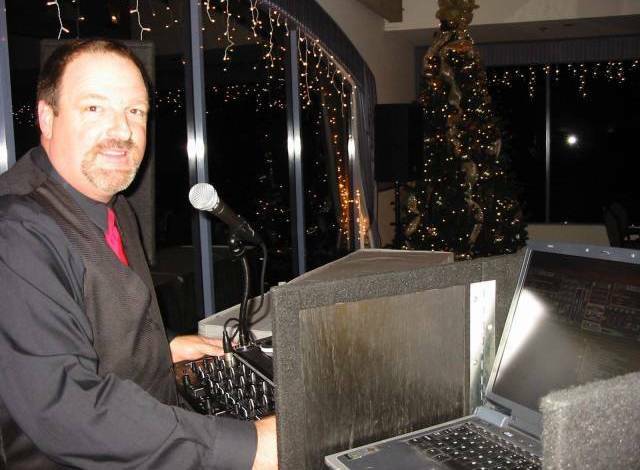 in ELB's Los Altos area, supervised by Mike Teplitz, Guest Service Team Leader and Volunteer Coordinator. Cat-Hatted volunteer reader Michelle Levesque did a splendid job, giving an enthusiastic presentation of Cat in the Hat. She also treated the students to a rousing reading of Dr. Seuss' Happy Birthday To You. Mrs. Crane credited Valeree Allen, a former employee at the Los Altos Target, for arranging the event. Ms. Allen worked in Mrs. Crane's class as a substitute for roughly six to seven weeks. Target says it has participated in Read Across America activities for over five years. The company's web site (www.target.com) notes that in addition to Read Across America, Target is partnering with the U.S. Department of Education, the No Child Left Behind Act, and Reach Out and Read� (a pediatrician-based literacy program) for "Ready. Sit. Read!" "Ready. Sit. Read!" is a national reading program that the company says helps parents foster a love of reading in their children. It puts books in the hands of parents through pediatrician visits, awards schools across the country $10,000 in books to customize their libraries and sponsors a national writing contest with the Library of Congress in which children write a letter about an author who has inspired them. NEA's web site says its Read Across America events are meant to focus "the country�s attention on how important it is to motivate children to read in addition to helping them master basic skills...Dr. Seuss�s use of rhyme makes his books an effective tool for teaching young children the basic skills they need to be successful." NEA says Read Across America, which was launched in 1998, has become the nation's largest reading event.